Billy and Fatcat are walking through the forest greeting the animals they pass. On their way back however, they find the forest animals have disappeared and then suddenly Billy and Fatcat are captured. Billy is completely unphased by this however; when confronted by a very scary terrible beast planning to make the forest animals into his supper, she works hard to outwit him. Luckily, she has lots of useful supplies which she surprisingly stores in her plentiful curly hair! This story is great fun with a quirky and resourceful heroine who thwarts a scary monster. Her side kick Fatcat is very appealing too. The illustrations are bold, bright and appealing. Read the story aloud to your child pausing to talk about what is happening in the story and pictures when your child wants to. Look to see if you can spot the terrible beast lurking ready to pounce in the first double page spread. Talk about the ways Billy tricked the beast. What sort of things would you store in your hair if you were Billy? 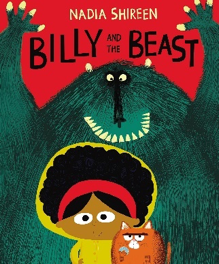 What would your child like to say to the beast or to Billy if they met them? As they become familiar with the story children will enjoy joining in with the parts, perhaps the sound effects eg the ‘terrible rumbles, and the ‘stomp crunch and splash,’ and greetings to the animals in the forest. Go for a walk in the woods or a park, making some of the sounds and movements from the story as you go – stomping on hard ground, crunching through leaves, splashing in puddles and jumping over logs. Watch out for the terrible beast! When you visit a park or woodland collect bark, fir cones, acorns, fallen leaves and twigs etc. At home set up a small world forest in a large tray or box. Add soil, pebbles and rocks, plants and the things you collected in the woods. Put in toy woodland animals, as in the story, a figure to be Billy and perhaps a larger toy for the beast. (or if you are feeling creative you could make your own terrible beast together from junk and fabric!) Act out the story together, children might like to make up their versions and create different stories too. Make a ‘terrible soup’ for the beast with your child. Have edible ingredients available. Your child can help you choose what to include and you can have fun together imagining the ingredients are something stranger eg perhaps sliced mushrooms might be mouse ears, chopped turnip – sharks teeth, green lentils – snake scales and so on . Mix all the ingredients together with a vegetable stock and cook slowly until the vegetables are soft. Enjoy eating you’re your terrible soup! Together you could write your recipe for terrible soup for the beast. Some children may be able to have a go at writing for themselves or drawing the ingredients, or you could scribe their ideas for them. Children could have fun making scary masks for themselves or their soft toys – just like Billy does for the rabbits in the story. You could use small paper plates; your child could help design the features and you could cut out the eyes for them. Tie the mask onto toys with wool or thread or attach to a lolly stick handle for your child to hold. When you go for a walk through a wood or to a park look for small animals and creatures. Although it may be unlikely to see small mammals, you might see evidence of them, for example rabbit or foxes’ holes, rabbit droppings, acorns or fir cones with gnaw marks on them. You may be lucky to see a squirrel, birds, snails and other mini beasts. Talk about what you spot together. Talk about the importance of taking care of animals’ habitats. children might be interested to learn that hedgehogs are declining in numbers.